In October 2005, two North African teenagers died of electrocution in one of the banlieues of Paris as they were running from the police through a dangerous power substation. An inquiry later established the teens were innocent, and the incident sparked some of the worst unrest seen in France over the past 40 years. The riots brought about much debate over the tense relationship between immigrant youth and the state, the recurring problems of “fracture sociale,” and a perceived lack of social justice. Above all, the protests were an expression of acute feelings of alienation experienced by a large section of society. The banlieues have been a breeding ground for deep frustration, maintaining a distinctly poor and marginalized status for decades. Unemployment is common and 36% of the banlieu residents are estimated to live below the poverty line—three times the national average. In a different context, yet similar in spirit, the Arab Spring was triggered by an overwhelming lack of dignity, due to a combination of poor domestic governance and external geopolitical manipulations by external powers. These two examples share an important lesson about the crucial importance of human dignity. Although often invoked by scholars, theorists, and leaders, dignity and its critical role in good governance remain insufficiently understood or appreciated. More than the need for freedom, democracy and free elections, dignity is fundamental to human existence. It cuts across North/South (hemispheric), social, ethnical or political divides. Guaranteeing dignity for all, at all times and under all circumstances, is inclusive of all democratic principles in the first place, while simultaneously addressing inequality, something most liberal democracies tackle insufficiently. Dignity is also more meaningful and encompassing than the notions of liberty and democracy. If we take dignity as a standard for good governance, it exposes the numerous inadvertencies in liberal democracies. I would like to briefly mention here the example of Singapore. While the previous two examples have highlighted political failures, Singapore’s case highlights exactly the opposite. Singapore does not have many of the conventional criteria of good government under the rubric provided by Western-style liberal democracies. However, its form of governance has clearly provided a quality of life surpassing that of many liberal democracies and an environment where citizens enjoy conditions for a dignified life. Certainly, there are discrepancies if we look at its institutions. Graham Alison suggests we look at the idea of liberty in terms of “liberty to” and “liberty from.” Here, the metrics reveal surprising findings. In terms of “liberty to,” Singapore does not enjoy extensive freedom of expression, political pluralism or freedom of the media. However, the “liberty from” metrics reveal a different picture: Singapore has a high life expectancy and low infant mortality. The chance of violent death in the United States is twelve times higher than in Singapore. Singapore scores very high in terms of economic freedom and very low on indexes of perceptions of corruption. A Gallup poll in 2014 also showed that the majority of the population was “thriving in financial well-being.” Singapore has created a system that has managed to minimize exclusions and marginalization in society, ensuring that opportunities and good public services will be available to all. This does not mean that the Singaporean system is necessarily better than Western-type liberal democracies, but it does suggest that there are other factors that are important for sustainable governance and prosperity than mere political freedom. What are the substrates of dignity-based governance? While philosophy has been preoccupied with the meaning of human dignity for decades, its specific role in good governance has received less attention. My aim is to bring dignity into focus, and to do so with insights from neuroscience. The neurochemical underpinnings of human nature provide invaluable understandings about the importance of dignity to humans, proving its critical role in governance. My theory of emotional amoral egoism explains human nature with a heightened focus on morality and its interplay with practical policymaking. With insights from neuroscience, this theory argues that human nature is characterized by emotionality, amorality, and egoism, and that working for social cohesion and sustainable history requires careful consideration of the dignity needs of human beings. It is important to note that what I mean by dignity is much more than just the opposite of humiliation. It is a holistic governance-based framework. In order to quantify this accurately, I previously identified, in my Sustainable History theory, nine primordial governance-based dignity needs, including: reason, security, human rights, accountability, transparency, justice, opportunity, innovation, and inclusiveness. Each one of these is conditioned or motivated by aspects of our nature (emotionality, amorality, egoism), and must be upheld at all times. My central task is to describe the features of our nature, and to resolve these with those respective dignity needs that require attainment in order to ensure a more sustainable domestic and global order. Since the publication of my account of human nature, researchers have continued to aggregate results demonstrating the powerful role the emotions play in the cognitive process. Although for a long time emotions were thought to be non-cognitive, more recently it has been shown that we make emotional inferences with great frequency. Moreover, emotional response will often precede our rational thinking. Neuroscientific research has revealed that it is common for human beings to rationally “decide” something only after emotions have caused a person to make a certain decision. Such findings show that our emotions are deeply involved in our decision-making and demonstrate our vulnerability to manipulation by those who appeal to our emotions with the intent to pursue their own agendas. This also explains why, for instance, in a climate of hopelessness, recruitment initiatives by terrorist organizations meet with considerable success. The capacity to discern clearly between our moral and immoral actions should not be taken for granted, especially when confronted with fear, deprivation, humiliation, or insecurity. These conditions can shift our moral compasses and should be kept in mind when designing policy. As I have argued at length, and as a great deal of contemporary research and typical experience has confirmed, the archaic notion of an inborn morality is false. Human beings are amoral at best and are susceptible to the conditions of the environments in which they find themselves. As a consequence, their capacity for moral feeling as well as their willingness to be socially cooperative is significantly determined by their environment. From this underlying principle, it becomes clear that untutored human nature is amoral and subject to whatever influences individuals may encounter. Again, good governance plays a fundamental function in enabling or obstructing the propensity for moral acts. It is unlikely that humans, most of the time, will be moral within the context of oppression and injustice. Conversely, the likelihood of brutishly immoral human behaviour in inclusive, accountable, transparent, and just regimes is significantly reduced. Although we lack innate morality, human nature does come with a minimal predisposition geared toward survival. I have previously described this aspect of our human nature as a predisposed tabula rasa, indicating that we are born with a basic suite of survival instincts that will always guide us towards those actions that ensure or maximize our chances of survival. Besides these instincts, humans are otherwise “blank slates” that receive the bulk of their character from experience. It is in this sense that human nature is fundamentally egoistic: at our most foundational level, we are only geared towards survival, and the rest of our moral compass is developed throughout the course of existence. This neuro-philosophical understanding of human nature presents a number of challenges that can only be addressed through appropriate forms of governance. Of the nine dignity substrates I previously identified, three in particular correlate to human emotionality: reason, security and human rights. Public institutions must be accountable in order to limit the power concentrated by single individuals or a group. History has shown repeatedly that regimes that aim to indoctrinate and hold absolute monopolies on truth are unsustainable will lose legitimacy, and ultimately, their grip on power. For example, the story of the demise of the Soviet bloc captures the contradictions of a strong state apparatus. It possessed impressive military, scientific and space programmes yet also profound internal weaknesses that eventually contributed to its downfall. The Communist Parties gradually eroded not only people’s liberties, but also their own sense of worth and dignity. The sense of disempowerment and alienation became unbearable. In Communist Ukraine, for instance, the assault on human dignity was systematic and had multiple sources. The public sector was in crisis, inflation skyrocketed, and housing conditions became deplorable. Freedom of religion and worship was severally repressed, often to the extent where priests would be represented as mentally unstable. These abuses of power did not go without consequences. The assurance of security is another requirement for stable social relations, as human dignity is closely linked to conditions of security. This does not apply exclusively to armed violence, but can also describe a more pervasive and constant state of psychological anxiety, which in turn creates the environment for pre-emptive violence. When basic security is scarce, the likelihood of a scenario reminiscent of Hobbes’ ‘war of all against all’ increases. Similarly, a clearly articulated commitment to human rights is critical to dignity–and sustainable governance. China has lifted millions out of poverty, but its citizens continue to face various forms of disenfranchisement from limited freedoms to forced relocations and unfair compensations in the process of development. In the early days of the Arab Spring, many observers speculated about a Chinese Spring. This did not happen, partly because China continues to offer enough opportunities to prevent bringing its people to the point of a generalized revolution. However, China will have to give consideration to the growing discontent–expressed nowadays via social networks—as well. In 2010 alone, there were reportedly 180,000 protests in the county. Man’s amoral nature must be balanced with accountability, transparency and justice. A fair and well-governed judicial system incentivizes pro-social behaviour while establishing consequences to serve as deterrents for antisocial behaviour. The judicial system must be transparent, accountable, and non-discriminatory. If these values are neither present nor visible to society, the rule of law loses its legitimacy. Therefore, if governments wish to be seen as legitimate, they must have a judicial system that is both transparent and perceived as fair. Justice plays another critical role. Impartial, well-functioning and transparent judicial systems constitute the backbone of good governance. The egoistic nature of human beings must be balanced by opportunity, inclusiveness and innovation. Opportunities for innovation, creativity and self-expression must be made available to all. Systems of education that foster cultural synergy and promote social cohesion will decrease the effects caused by economic disparity. Without this inclusiveness, the egoist element of human nature will find even its basic security threatened. In order to explain the relevance of this theoretical framework, I have compiled an index that proposes quantifiable indicators for the constitutive elements of human dignity. As outlined above, dignity means much more than the mere absence of humiliation. The absence or fulfilment of dignity is defined by a more comprehensive set of nine criteria. We can never be complacent about human nature, its inherent weaknesses, or its virtuosity. Governments must craft public policies carefully so as to mediate between the emotionality, amorality and egoism of human nature and our nine dignity needs. A close analysis of these indicators makes clear that dignity and a dignity-based model of governance do not necessarily overlap with liberal democratic values and systems of government, where exclusion and injustice can run rampant. A dignity-centered governance model would improve current forms of Western-type liberal democracies yet still be applicable across various political systems and cultural frameworks. In terms of quantifying human dignity, I have studied several existing surveys that measure indicators such as human rights, accountability, and justice. In this regard, I have found that the Fragile State Index (FSI), for example, published by the Fund for Peace, is particularly helpful when measuring distinct indicators of human development. 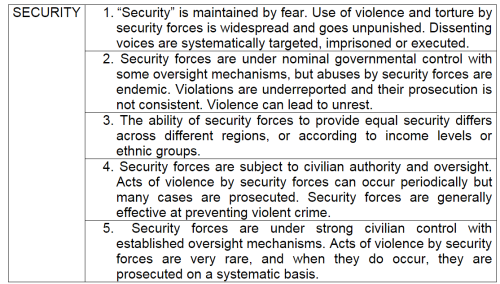 The FSI measures 12 indicators, many of which can be applied to my human dignity framework. 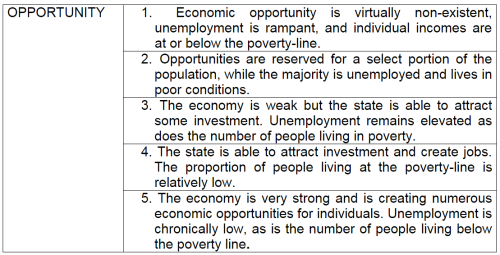 I have formulated my own ranking for human dignity and its components based on a score from 1 to 5, with 1 meaning the indicator is completely absent and 5 meaning that the particular indicator of human dignity has been fully integrated into society and is fully protected by the law and the state. Therefore, the higher the score, the more integrated human dignity is within that state’s governance. Reason: The existence of reason can be argued to reflect how important dogma is to a society. I argue that a dignified society is one that is based on reason that encourages quality education for all. 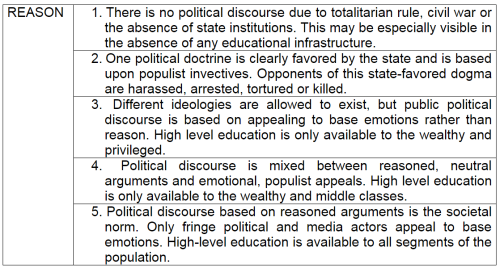 The political discourse in a dignified society does not favor dogmatic populism over true facts and reasoned arguments. Security: This is an essential component of human dignity, as individuals living under the constant fear of violence and death are denied their basic needs. The provision of the right to security must be conducted in an effective and accountable manner. Promotion and Protection of Human Rights: This includes protections against cruel and degrading treatment and discrimination of all kinds, of protected civil liberties; political freedom; and economic, social and cultural rights (education, work, health). 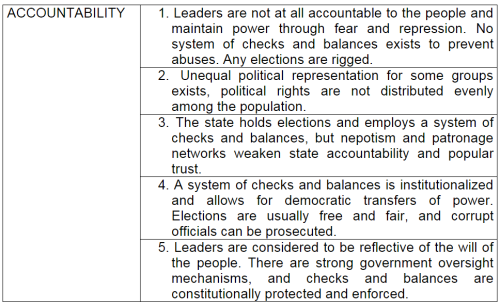 Accountability: State leaders must be accountable to the individuals they serve, as the lack of representation and ensuing feeling of disenfranchisement are indicators of inequality. Transparency: A lack of transparency also reflects endemic inequality and disenfranchisement vis-à-vis the state. Justice: Individuals need to benefit from the due process of law and are entitled to an independent judicial system which protects their dignity and full judicial rights. Opportunity: This can be defined as the ability of a state to provide economic opportunities for its citizens, which can be measured with economic factors. Innovation: The ability of a state to encourage professional, scientific and intellectual growth. 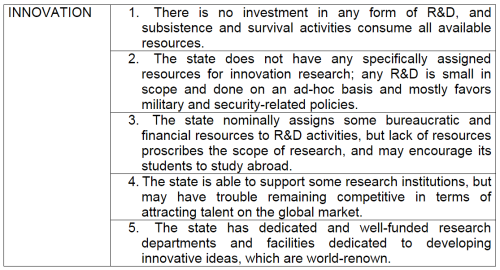 State funding for research and development (R&D) is a good indicator of innovation and can remedy to some extent the issues surrounding economic opportunity. 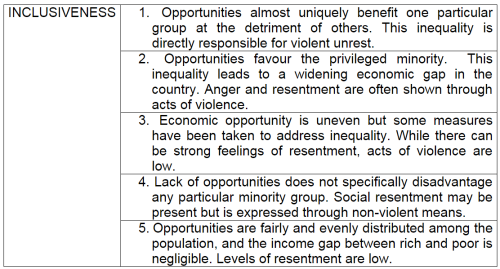 Inclusiveness: The presence of a significant economic gap between rich and poor not only prevents economic development, but may fuel the rise of deep-seated resentment, anger, and even violence. Below, we have applied the framework of human dignity through nine substrates in an evaluation of fifteen countries. The results paint a slightly different picture than the more traditional conclusions about international standards of responsible governance. The case studies analyzed represent just a small selection of countries. The same methodology can, of course, be further applied to virtually all countries. For each of the nine dignity needs I have used pertinent data compiled and measured in other relevant reports or studies. Quantifying dignity is a difficult task and we cannot expect to lay out definite or indisputable scores. However, while approximate, the values assigned for the case countries are based on a careful and thorough examination of the relevant indicators in each country. It is hoped that with this proposed dignity scale, it will become clear how the overall situation of dignity presents itself across countries and which indicators need to be improved. The final conceptual conclusion from this exercise is that dignity is not only essential to human beings—and that governance based on the fulfilment of dignity is most likely to remain sustainable in the long run—but also that dignity -based governance is not intrinsically present only in liberal democracies. Rather, dignity-based governance is complementary to liberal democracies. Numerous forms of marginalization or exclusion can exist in liberal democracies as well, and the mere existence of political rights does not guarantee a dignified life. While Western-type liberal democracies remain one of the most effective and tested forms of government in history, what is needed, globally, is not necessarily a transition to liberal democracy but rather a more careful consideration of the fundamental human quest for dignity, which often bears interpretations that are ‘endogenous’ and adapted to various socio-cultural settings. It is therefore critical for leaders and governments everywhere to give due attention to dignity as a central focus in policy-making. Failure to do so is bound to accelerate social unrest and destabilize domestic social and political order, and ultimately global order.